This rather simple yet satisfying martini is a mixture of raspberry Stoli, lemoncello and Chambord. 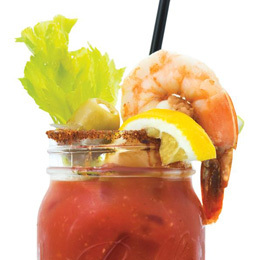 This impressive Bloody Mary served up at Woodcrest Country Club begins with Tito’s Vodka and a homemade “spicy tomato infusion,” and is outfitted with a blue cheese-stuffed olive, a celery stalk, shrimp and a seasoned rim. An award-winning cocktail that features tequila, pomegranate, lime juice, blueberries and a splash of lemon-lime soda.